Sonoma County has many many micro climates, not only relating to temperature, but also with precipitation. For example Santa Rosa averages a little over 30 inches of rain a year, but if you travel 10 to 20 miles away, rainfall averages can be much higher. Cazadero, in western Sonoma County one year received 117 inches of rain! Sometimes for several years in a row Cazadero receives well over 50 inches of rain each year. Santa Rosa tends to have a significant amount of fog in the summer months but each summer can certainly vary in the amount of actual fog experienced. A number of folks who live in the San Jose Bay Area often refer to Santa Rosa as being very hot in the summers. 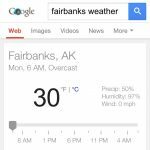 This is incorrect – days go by in the summers where fog just sits in the Santa Rosa plain every morning and may or may not clear out by mid day or afternoon and temperatures during these times remain quite chilly. During “normal” fog spells, the fog usually lifts by mid to late morning. During these spells you can drive 20 minutes north and be in sunshine or 30 minutes south and see breaking up fog in the Novato area – or even sometimes you can drive closer to the coast in Sonoma County for sunshine as in out to Forestville. Weird? Yea, during certain times of the year, Santa Rosa attracts fog like bees to a honey hive. Summer hot spells in Santa Rosa rarely last for more then a few days. As a result, compared to much of the country, Santa Rosa does not experience a “true” summer in the sense of prolonged hot temperatures. If you go just a bit inland you will experience a *much* nicer and warmer/hotter summer. If heat is what you are after, Santa Rosa is certainly not the place to live. Humidity? Santa Rosa is located in a Mediterranean climate – little or no humidity here. Dry very mild summers, cold often rainy winters. The temperature reaches 100 or over in Santa Rosa maybe 3-6 days out of the year if you are lucky. 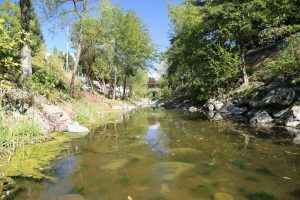 The upper Napa Valley in Napa County – just east of Sonoma County, or Cloverdale in northern Sonoma County tend to be much warmer then Santa Rosa in the summer months. 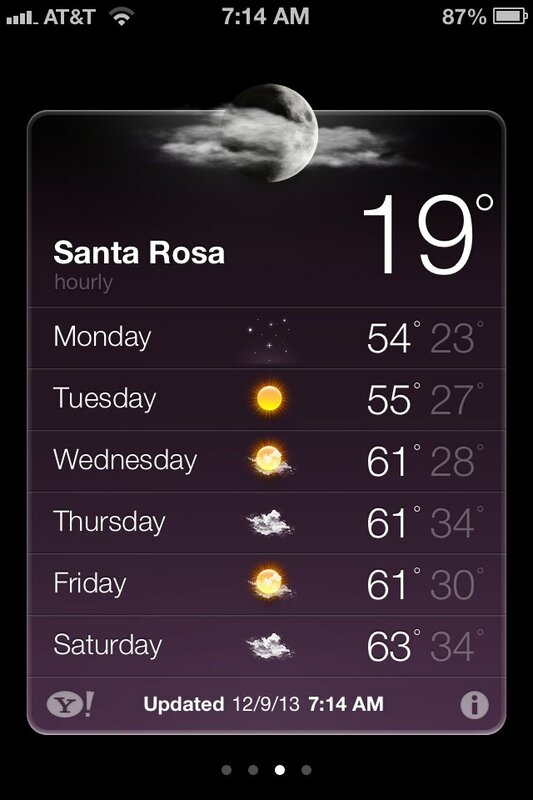 However, Santa Rosa is usually a bit warmer then these places in the winter. Warmer summers start well north of Santa Rosa around Cloverdale and Ukiah. The Santa Rosa plain sits in fairly close proximity to the Pacific Ocean (about 35-40 minutes driving) and as a result is *strongly* influenced by the frigid ocean water. Mid winter highs generally average in the mid to upper 50’s to low 60s. Weeks can go by without temperatures much above 58 degrees F. Summers are very dry and mild. Daytime summer highs usually remain in the upper 70’s to mid 80’s while summer lows are generally in the low to mid 50’s. It is extremely rare when a summer nighttime low stays above 65 degrees (the best chance of this happening is in the Fall). The all time record high in Santa Rosa was 113 degrees and the all time record low was 9 degrees. Almost without fail, the weather turns to crap between the last week in October and the first week in November and generally remains so for all of November, December, January and most of February. Four miserable things generally converge at once at this time of year 1. including shorter daylight hours, 2. much colder weather both during the day and night, 3. grey skies and rain at times and 4. visually uninspiring vegetation. 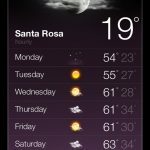 If you have a strong aversion to cold weather, these are months you will absolutely want to avoid visiting Santa Rosa. Typically between the months of November and March Santa Rosa goes through a number of ‘cold snaps’ in which frost is common at night and the temperature hovers at 32 F or several degrees below. What is disgusting is that simply a 2-6 hour drive south to central or southern California will almost always put you in much better weather during mid fall through late winter. Because of the generally colder nights in the winter its difficult to grow semi tropical fruit such as avocados or bananas – although if you know where to look you can actually find several large avocado trees and a few small banana plants growing around town. And true insiders will know the select locations of Dragon Fruit growing in town (usually in well protected areas). Merely a 90 minute to 2 hour drive south will put you in a region where you can grow avocados much easier. During the shoulder seasons – mid to late Spring and mid to late Fall, it is not uncommon for a storm to come into Sonoma County and produce rain – where south of the Golden Gate Bridge and San Francisco it will be completely or nearly dry, merely 60 to 90 minutes south and while Santa Rosa is covered in clouds, to the south may be partly cloudy or even completely clear. One particularly recent cold early December morning featured a temperature in the teens in Santa Rosa – still 10 degrees off its all time record low in 1924. 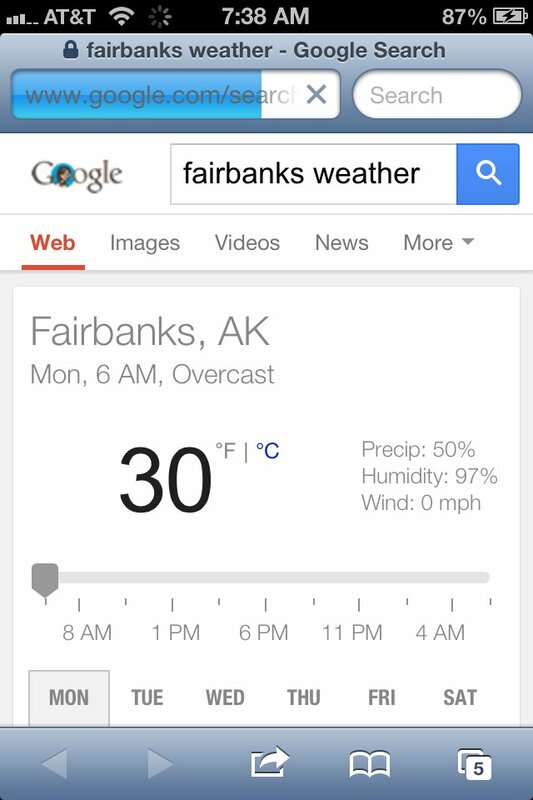 And Fairbanks thousands of miles away, just below the Arctic Circle to the north in frigid Alaska was a balmy 30 degrees the same morning, even an hour earlier! SR Weather: Mediterranean climates are the best. Don’t go by what a Los Angeles lover says. Yes, true Mediterranean climates are by FAR the best. That would be along the coastline from San Luis Obispo south – preferably Santa Barbara south. Don’t bother with anything north from end of October through end of March. 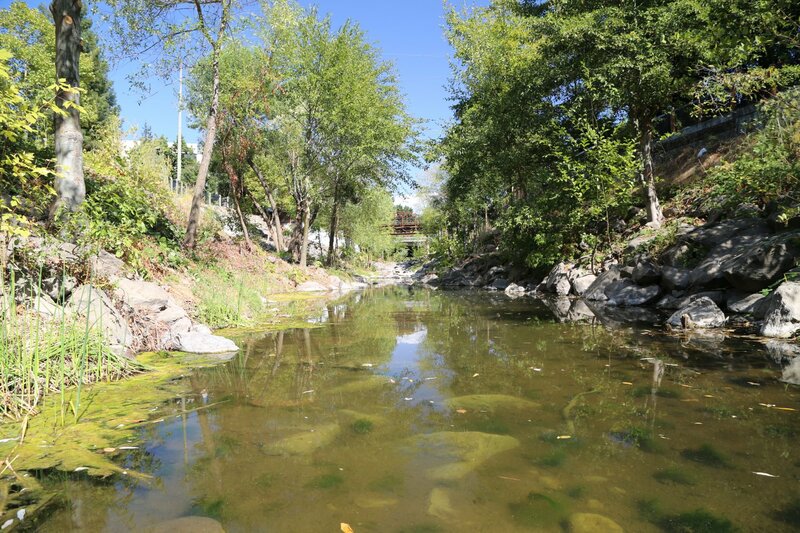 One pretty much needs two homes in this state – to handle the diversity of weather between winter and summer.